Back then there was a game called Rogue. Released in 1980, it was a dungeon crawler game with random dungeon generation, released on multiple platforms. It used a non-graphical (character based) terminal interface, so there was not even pixel art graphics back then. 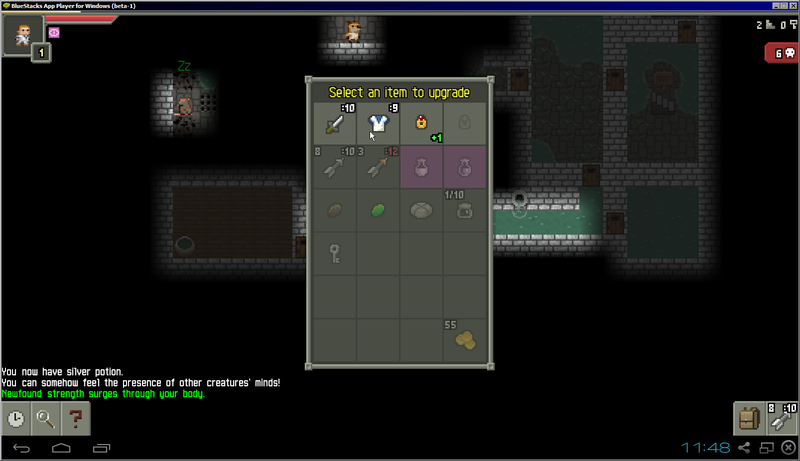 The player could get items, fight monsters, and go deeper in the dark and dangerous dungeons. 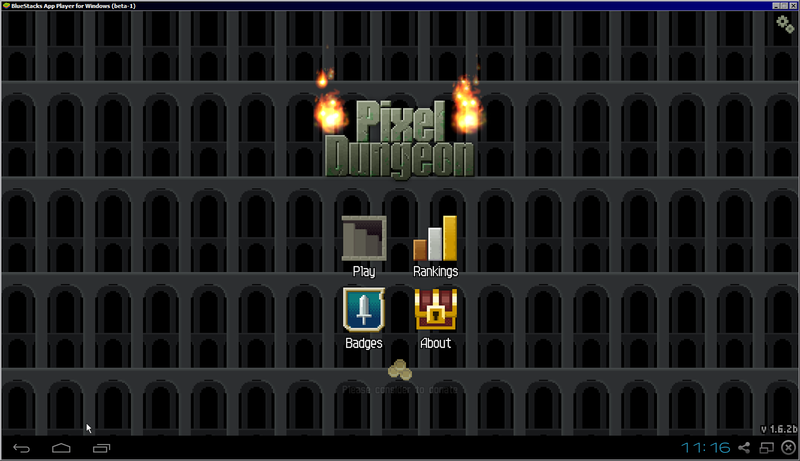 There are tons of rogue-like games, and Pixel Dungeon is one of them. The graphics are simple. it's pixel-y, but stylish, it look decent. The creatures are recognizable, the animations are good. There are different kind of floor and wall tiles. There is water at some places, also there are different kind of traps too. It changes environment after each 5 levels after defeating the boss (the first area is in a sewer). Nothing fancy, but it is good enough. Also, the player has a limited vision, which means, you can't see through walls, and plants. The gameplay and controls are pretty self explanatory. 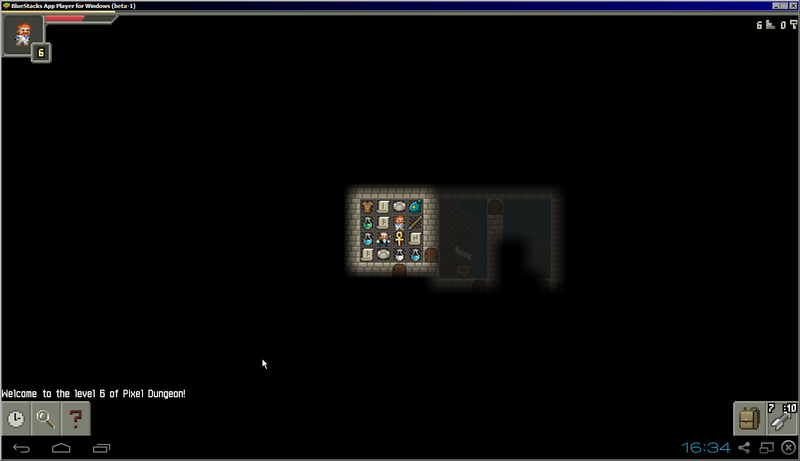 You can move your character in a random generated dungeon floor by tapping on a tile. Unlike most rogue-likes, you don't need to use keyboard or/and mouse you only use your finger and that's all, it's very well done. Also, there is a pinch zoom feature. It's not a real-time game, it's turn based, so moving takes you one turn (except if you are slowed down). So you have time to think, sometimes it is very important. Some bad moves can be fatal! You can attack by tapping on enemies. There are buttons at the bottom of the screen, you have a simple inventory, a secondary attack button (for throw-able weapons and wands). Also, you can wait turns, and search around you. Searching is a good ability, you can check for traps and hidden doors. Very useful. Some items can improve your searching ability. 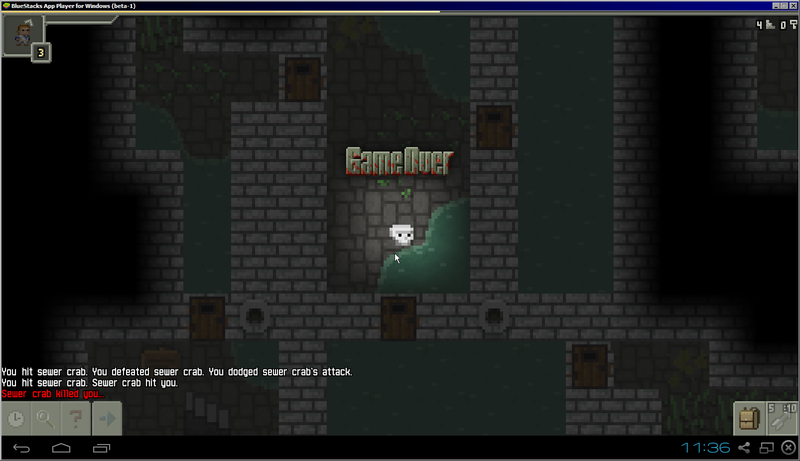 About the combat, it has some randomization factor. All weapons and armors have an average value of damage and damage absorption. Also there is an accuracy and speed property of the items. Some weapons are powerful, but slow, which means, a normal speed enemy can attack twice or more. This screen will burn into your retina. The game is very hard! Also, there are scrolls, potions, food, seeds and other good (and bad) things. some potions heal, some potions are harmful, there is a great variety here. You can drink them, or you can throw them. if you have a potion of liquid fire, you don't want to drink, throwing is a better idea, you can damage you enemies with it, or burn down obstacles. But in case of both potions and scrolls you don't know, which does what. You need to try them out! There is a scroll called scroll of identify, it is helpful you can find out one item's properties. Food is important too, you can starve to death in this game. starvation depends on your character type (there are four different character classes to choose from at the beginning (well, it's three actually, one of them is locked)). Some levels have locked doors and their keys, these rooms are helpful because they are safe and you can get some items. The game is fun, has a great variety, it's good for both for some minutes of playing, but sometimes, you'll play hours and you will never get bore! 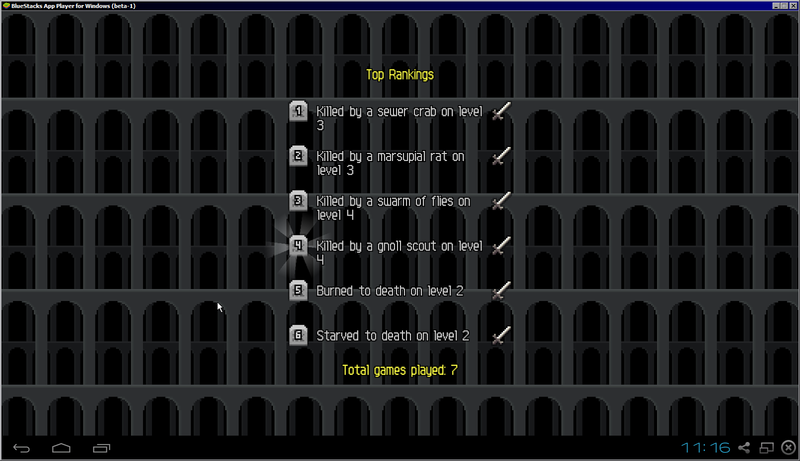 You have a ranking about your best runs. I have to mention one more thing. The game is hard and unforgiving sometimes. If you escaped from the sewers you are good. The game needs some luck and good strategy. Getting powerful weapons and armor is mandatory however, sometimes good potions and scrolls can be handy in some situations. There is no save feature (actually you can quit the game and continue later, but you can't save while playing to load after a failure). You only live once, if you are dead, you start from the very beginning of the game. It's time for shopping! It's hard to get here. Some words about the sounds. They're simple, there are sound effects for everything, but nothing special in overall. And the music is... well, it's good, but after a while, it gets very repetitive. In overall, it's a great, fun game. Challenging, yes, you'll die a lot but it is that kind of game that you'll try again and again and again and again... It is never boring. It's very addictive. And I have to mention its price. It's free. And by free I mean, you don't pay for it, there are no in-game transactions and there aren't any ads! You can donate to the developers (they deserve it) and that's all! If you like these kind of games, try it out. It runs on a lot of devices, easy to control and it is long hours of fun and failure. One of my best finds on Google Play. I'm glad I discovered this gem.